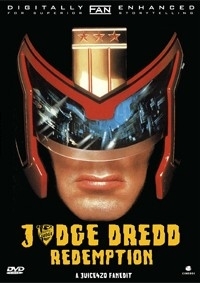 In a dystopian future, Dredd, the most famous judge is convicted for a crime he did not commit. My main focus doing this edit was to try and take out most of the comedy relief and try and make it a slightly more serious movie. Its obviously a Stallone/90's action movie. But still I always despised what Rob Schneider brought to this movie with his over acting and stupid one liners. Only the hero gets one liners! So overall it was mostly nips and tucks and slight rearranging. Rogue-theX for watching my work print and suggesting many things that helped make this edit better. NOTE: This edit has filters on it to give it a gritty feel. The grainy picture is intentional, as well the source DVD isn't very high quality. -Cut entire opening scene with Rob Schneider and now after the text scroll it cut’s directly to the block wars. -Cut all instances of Rob Schneider speaking from block wars until after Dredd has cleared the building, we do not hear anything from him until he emerges from the Service Droid. -Rearranged and cut most of the prison flight scene. All comedy has been removed and the outlaws are not reveled, we only see a rocket being launched at the ship. Keeping the outlaws a mystery until Dredd sees them. - Cut out most of the speaking parts from Rob Schneider during the Outlaw cave scene. Some of Rob Schneider’s reactions to the fight are left in mainly due to the fact I had nothing to cut too. So some of it had to stay for continuity. -Cut most of the conversation between Dredd and Rob Schneider outside the Wall’s to Megacity. Now it’s much more of a what do we need to do, instead of a “Awwww why do we have to go in there” type scene. -Cut various reactions and one liners from Rob Schneider to tone down his stupidness during the escape from the Council chambers and the Bike chase. Including when Rob Schneider tells Dredd he peed his pants. -Cut Rob Schneider’s lines at the end of the movie, we simply see him for a few seconds on a stretcher so that we know he lived. What I liked: The narrative was greatly improved and streamlined. Rob Schneider's was almost entirely removed, which keeps the movie more serious tone. What I didn't: The movie was edited together amazingly but there added the the film grain drove me nuts. You're not alone. I've seen this in a few edits now that I think it adds nothing to the experience, and only takes away. When I see grain now I only think of low quality equipment in low lighting, or just low quality equipment. I don't think grain makes a movie look edgy or nostalgic. This is why I'm rating the visual editing so low, it drove me crazy on my tablet (plane ride). Overall: A better version than the original. The Audio/Video Quality, seemed below a DVD, but it might have been the encode or the grain or both together. I would recommend anyone wanting to see the original to see this edit instead, grain or no grain it is still better. Extra: This edit would benefit from a re-encode from the source material, also you should NOT include the grit filter. A really enjoyable fanedit for anyone that actually likes Judge Dredd. The narrative was really well done and streamlined. Rob Schneider's character is almost entirely omitted which lets the movie keep a more serious tone but makes him seem completely usless. Which to be fair, he is in the original. Visually the movie was edited together extremely well but there where times the the film grain became distracting and seemed unnecessary. Enjoyed this edit a lot and hope to see more like it. Not a perfect movie but then the original wasn't either. While I did appreciate the more serious feel to the movie I felt too much of the Rob Schneider anctics were left out. At the very least I feel the first scene of Dredd encountering Schneider's character should have been left in the film somehow. Not a bad interpretation of the movie, wasn't a big fan of the grit filter used though. Glad I had the opportunity to watch this edit!! Recommend to any Dredd fans. When Judge Dredd first came out, I remember not thinking much bout it. It just seemed like a mindless cheesy action movie with Stallone. After seeing Redemption, my opinion has changed. 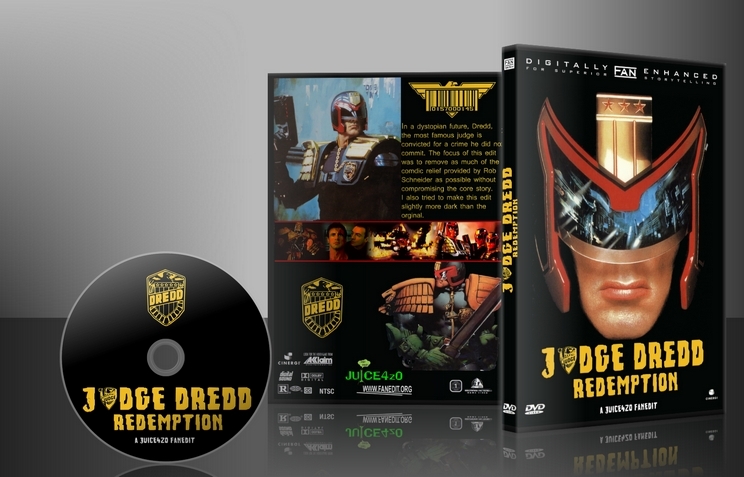 Juice's editing turned the film into one that I'd be happy to have sit on the shelf alongside 2012's Dredd. This is my go to version of Stallone's Dredd. Finally got to this one. I didn't become a Dredd fan after this film came out, but I have become one after seeing the 2012 version, so I was excited to revisit this. I was not disappointed at all with this fanedit and thought the editor did a great job of cutting out a lot of the schlock, while preserving a plot. I won't dwell too much on the nitpicks, as they have all been mentioned by other reviewers already. Quickly, the issues I saw that bothered me the most were the grainy picture, the hard cut after the bike chase and some of the over the top acting by Stallonw and Assante that was left in. For whatever reason (I haven't figured it out), I really enjoyed the first half, but it kind of lost its appeal during the second half. Thank you for doing this edit. It was great to see this film tightened up so well.